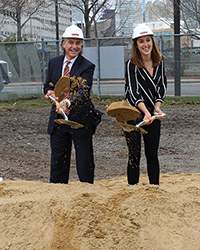 Boston, MA Intercontinental Real Estate Corp. (Intercontinental) and Harbinger Development formally broke ground on the Hampton Inn by Hilton and Homewood Suites by Hilton Boston Seaport. The $176 million, dual-branded hotel is being built at 660 Summer St. in the Seaport District, within the Raymond L. Flynn Marine Park adjacent to the Design Center and the Cruise Port Terminal, and near the Boston Convention and Exhibition Center and Logan International Airport. The hotel will include a 14-story tower, more than 400 guestrooms and amenities, including 7,400 s/f of prime restaurant/retail space, a fitness center, heated pool, business center, complimentary breakfast, nearly 60 second-floor valet parking spaces and an outdoor terrace. The new Hampton Inn by Hilton and Homewood Suites by Hilton Boston Seaport will bring needed value-focused lodging options and additional hotel room supply to the Seaport District and overall Boston market. The project will also create nearly 400 union jobs. 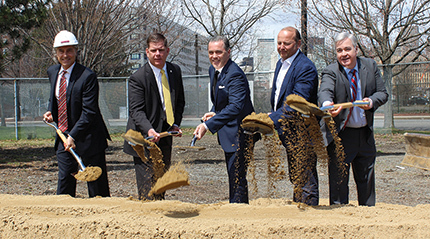 The general contractor, Suffolk, started construction on the new hotel following a groundbreaking ceremony attended by many local dignitaries, including mayor Marty Walsh. 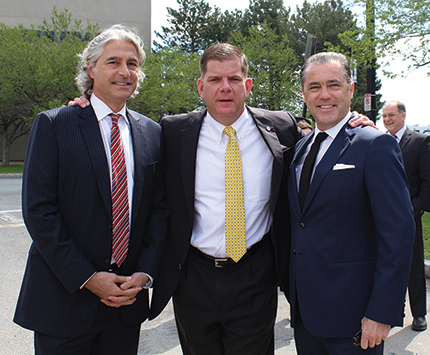 Harbinger partner John Matteson, and Boston city councilor Michael Flaherty. Architects for the project are Perkins & Will and Group One. Consultants include TR Engel, Bohler, McNamara Salvia, and Lightship. Intercontinental and Harbinger entered into a long-term land lease with the Boston Economic Development Industrial Commission last year.